At any one time, you will probably find me with a group of RSFSR covers which are waiting to have their Tariff period identified and their franking checked against it. Sometimes it's a slow job. Maybe it was a slow job for the postal clerks too. Here are two ordinary letters sent from GOMEL P.T.K, the first sent to New York on 16 June 1922 and the second to Paris on 24 July 1922. Both were routed through Petrograd and picked up Three Triangle censor marks there. The Paris letter has a receiver cancel. 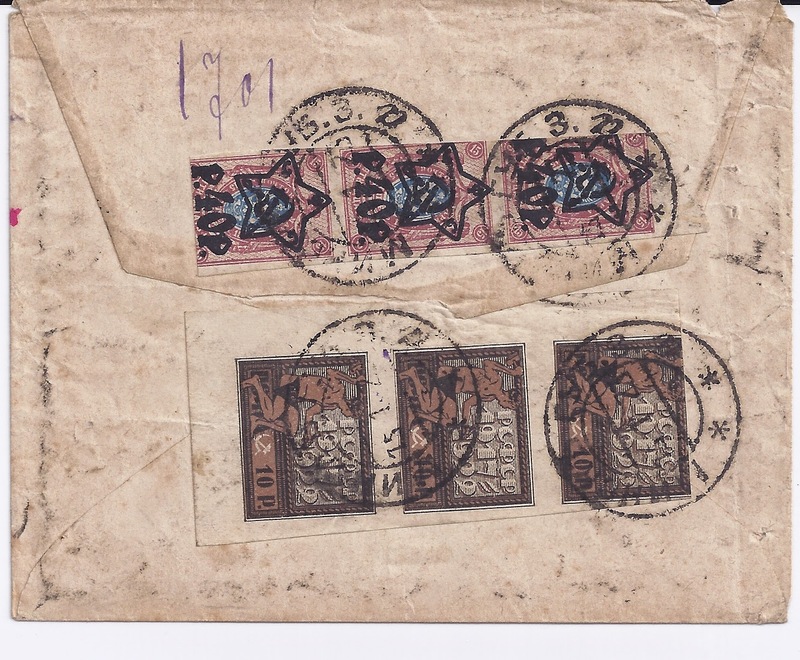 The first cover has been carefully sealed with five stamps - I guess the idea was to make the Censor notice the cover, which he or she did - the envelope has been opened and re-sealed through the middle of the back flap and then opened at the top by the recipient. Anyway, this cover is correctly franked. The Tariff of 4 June 1922 applies and it specified a charge of 200 000 roubles for an ordinary letter going abroad. The franking makes that total as follows: 2 x 4 kopeck stamps already revalued to 4 roubles each now further revalued to 40 000 roubles each + 10 kopeck revalued on the same basis to 100 000 + 1 rouble revalued to 10 000 roubles + Charity stamp [ I am assuming] revalued from 100 rouble franking contribution to 10 000 = 200 000 roubles. The Tariff of 1 July 1922 applies to the second cover and specifies a charge of 450 000 roubles for an ordinary letter going abroad. The home made envelope may also be franked to attract the Censor - the franking could have been simpler. What we have is this: 4 x 10 kopecks previously revalued to 10 roubles now revalued to 100 000 roubles each + 2 x 1 rouble revalued to 10 000 roubles each + 4 x 7500 rouble surcharges used at face = 450 000 roubles. The next cover is not such a mathematical challenge but it does illustrate an uncommon Tariff. 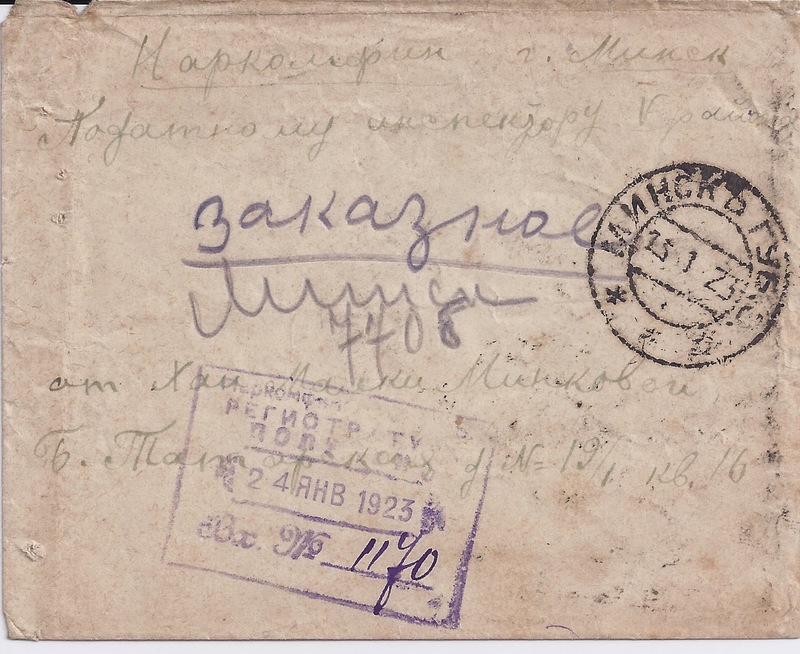 This is a Registered cover sent locally within Minsk with a MINSK GUB 15 1 23 cancellation. The letter is addressed to the People's Commisariat of Finance - "NARKOMFIN" in the first line of the address and again on the violet registry cachet. 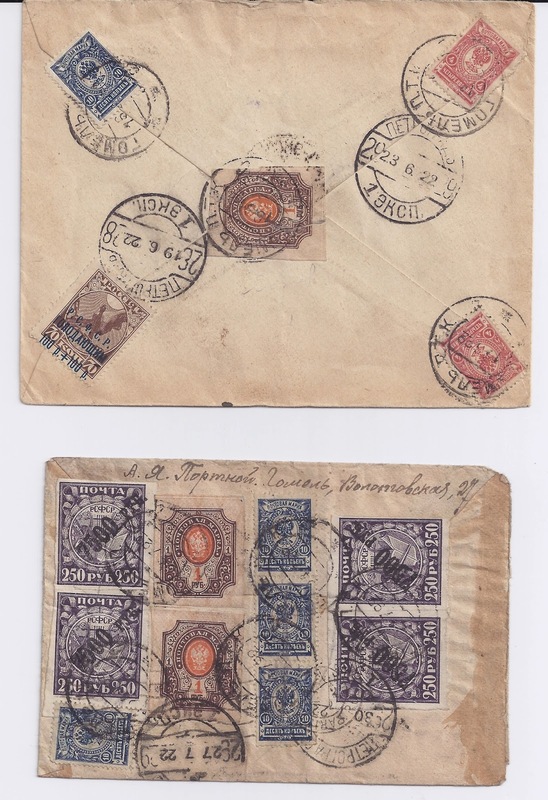 All the five stamps are used at face value and add up to 150 roubles of which 50 roubles is for the reduced tariff for sending a LOCAL letter and 100 roubles is the standard registration fee. How much are these covers worth? They are for sale at 50 €uro each, net.